Times Internet Ltd (Indiatimes), the mobile and digital arm of media group BCCL, has partnered with California-based Shorthand Mobile Inc to launch an app called SMS Browser. The browser replaces the existing method of submitting keywords to short codes to subscribe to value added services such as cricket, news, astrology and dating SMSs that are sent daily. Shorthand is essentially an easier user interface that allows you to pick your service by clicking. It then sends the subscription information automatically to the telco and you will start receiving text messages. There is no data usage as the app uses text messages to send and receive information. 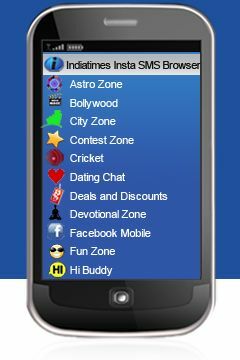 Once you visit Mobile.Indiatimes.com and click on InstaSMS under the Specials section, a download of a Java based app Shorthand.jad is triggered. Users can launch the app to browse through Indiatimes' SMS services. A list of compatible handsets has been provided here. Shorthand's app is also available on RCOM's app store. Indiatimes recently launched a daily deal site called TimesDeal.com and extended its mobile deals and discounts service Active Deals to 25 Indian cities.